The Minnesota state seal identifies government buildings and officials and is a centerpiece for the Minnesota state flag (the colors are different). The symbolism, history and emblems of the seal are described in this article. The Territory of the United States Northwest of the River Ohio (the Old Northwest) covered more than 260,000 square miles and consisted of the modern states of Ohio, Indiana, Illinois, Michigan, and Wisconsin, as well as northeastern Minnesota. 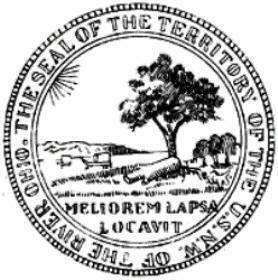 The first recorded use of The seal of the Northwest Territory (the Old Northwest) was in a proclamation made on July 26, 1788. Congress passed legislation on May 8, 1792, that directed the U.S. Secretary of State to "provide proper seals for the several and respective public offices in the said Territories". The Great Minnesota state seal was introduced when the state was admitted to the Union. A male Native American Indian wearing a loincloth and feather headdress and carrying a long spear is galloping on horseback looking towards the figure of a farmer. The Dakota and Chippewa tribes lived in Minnesota when the first Europeans arrived. The barefoot male pioneer wearing clothing and a hat of that period is plowing the earth, using an animal-drawn implement from that period although the animal is not visible. 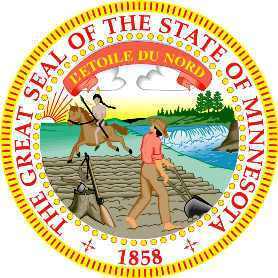 The Minnesota seal is kept and used as required by the Constitution and laws of the state. This is a flyer depicting the 1876 design of the Minnesota seal. The picture is interesting as it reflects the lifestyle of the early settlers. A loaded haywain is pulled by oxen with a farmer representing the agricultural industry. On the other side a pioneer in buckskins is seen racing across the prairie.